1. 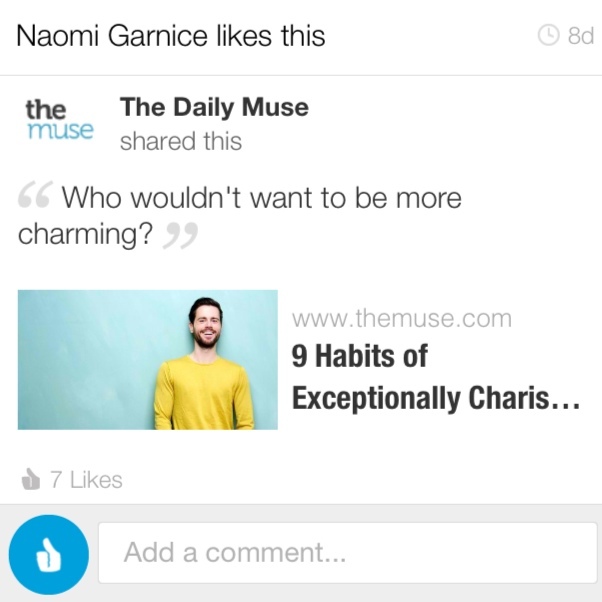 Should you really be liking that post on LinkedIn? When you like or comment on an “edgy” image or post, connections scanning through their feeds see those postings too. A perfect example is an anti-abortion posting that appeared in my stream this week accompanied by a upsetting graphic photo and blurry text. The image landed in my feed after my connection’s first like, and then continued appearing in between posts every time he commented. Opinions aside, he probably doesn’t want that to be the first image that pops into someone’s head whenever his name or his company’s comes up, right? Right. 2. Are you rushing through your Inbox? A lot of us try to power through emails as quickly as possible, we want to be seen as efficient and responsive. Typos, misspellings and sentences that just don’t make sense can make the savviest professionals look less intelligent. Slow down and read your emails out loud before clicking ‘Send’. Whether you’re sending it from Outlook or your iPhone, taking the extra two minutes can make a difference. Another smart and fast fix is using Hemingway, an app that helps you send concise email messages that always read well. 3. Still sending chain emails? I still receive these on occasion, usually from relatives, but occasionally from a colleague. A long list of other people’s email addresses and some unreasonably large image attachments usually come in tow with these messages. Chain emails are impersonal and aren’t relevant anymore when anyone can easily share photos and postings on Twitter, Pinterest or Facebook in seconds. Feel like sharing? Why not hop onto one of those networks? You’ll definitely look more tech savvy. Which personal brand killers top your list? Share your top three in the comments below! This entry was posted in Career Do's, Content Marketing, Introduction, LinkedIn, Naomi Garnice, Naomi Rochelle Garnice, Personal Brand, Social Media, Uncategorized, Writing. Bookmark the permalink.